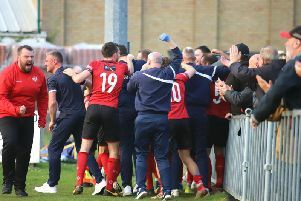 The Poppies put themselves on the brink of promotion after Aaron O’Connor’s stoppage-time goal secured a 1-0 victory at Leiston. With second-placed Stourbridge being held to a 1-1 draw by St Ives Town, Kettering are now 13 points clear at the top of the Evo-Stik League South Premier Division Central. It all means that if they beat play-off contenders Alvechurch at Latimer Park next Saturday then they will be crowned champions, although a point would be enough if Stourbridge were to lose at Needham Market. Either way, it’s now a question of when and not if the Poppies lift the title. But Law would love nothing more than to do it on home soil and, despite his team not being at their best in Suffolk, he believes the news of Stourbridge’s draw filtering through while the Poppies were still drawing 0-0 drove his players on to the late heroics. 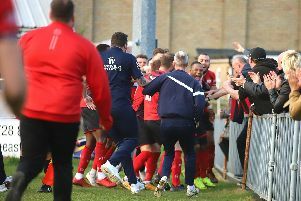 “We didn’t play particularly well, we weren’t as creative in the final third as we have been,” the Kettering manager said. “But if there is something we have had this year it is the commitment, the endeavour and the perseverance. “When we heard the result from Stourbridge, we threw it out there to the lads and it just lifted them and we have managed to grind out another win. “We have put ourselves in a fantastic position and now we want as many people as possible to come down to Latimer Park for next week’s game. “We want to try to win it ourselves, we don’t want it to be handed to us. “We want to set up a big party next weekend but I am not going to be disrespectful to Alvechurch because the game is certainly no gimme. “They are a good side who are pushing for a play-off place and it’s another big game for them. O’Connor’s crucial strike came in his first game back after serving a three-match ban. And Law added: “To be honest, the majority of our chances fell to him. “He had a couple in the first half but when you have someone like him on the pitch, you always feel like something could happen. “We threw Brett Solkhon on there in the second half and we just gave it a big push.